This book is not only just for belly dancers, but also for ballroom dancers, women who like to wear fancy bras underneath sheer blouses, showgirls, and anyone else who wants to wear a decorated bra, either as a costume item or as a dressy garment. It provides detailed instructions, step by step, on exactly how to cover a lingerie bra with ornamental fabric and how to decorate it. This book is designed to provide detailed, step-by-step instructions for making a decorated bra to belly dancers, ice skaters, ballroom dancers, showgirls, and anyone else who wants to wear one. The book opens with an overview of the key steps, setting the stage for what to expect from the process as a whole. It then moves quickly into the design phase, offering guidance on key decisions that should be made early in the process to create a great-looking piece within the available budget. It offers ideas on how to tie together the bra with whatever accompanying costume piece (such as a belly dance belt) may be worn with it, and offers a list of questions to consider when planning the design. It offers several croquis (outline drawings of plain bras) which can be traced or photocopied and used for sketching design ideas. Following these preliminaries, the book moves right into the project. Phase 1 discusses how to choose a foundation bra. It talks about the characteristics to look for in choosing a good one, describes the mechanics of bra construction and how to tell whether a certain bra is a suitable choice, and how to ensure proper fit. A page on bra styles describes the different types available in the market and how to decide which would work best for the desired costume "look". Phase 2 of the book focuses on making a pattern to use in cutting out the fabric that will be used to cover the bra. It talks about different methods for doing this, including drafting, tracing, draping, and flat patterning, with comments on the pros and cons of each. It shows how to prepare the bra, using grosgrain ribbon and interfacing to reinforce areas that will carry the most stress when the bra is decorated and worn. The section on straps offers several ideas for varying the arrangement of the straps to make the bra look less like lingerie and more like a true costume piece. Throughout the chapter, there are instructions on making patterns for the center front piece, the straps, the cups, and the band. Phase 3 provides instructions on how to cover the bra with fabric. It addresses all the different parts: the connecting piece in center front, the cups, the straps, and the band. It indicates how and where to insert padding, plus how and why to line the bra. Phase 4, the final major section, offers a variety of ideas on how to decorate the bra. It discusses options low, medium, and high price ranges, fringe, trims such as ribbon and braid, appliqués, flat surface beading, ethnic jewelry, and coins / chain. For each of these types of trim, it talks about the different variations available in the market, and how to apply it. 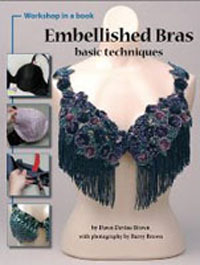 The book ends with some practical basics: how to do hand sewing, how to attach beads and sequins in flat-beading techniques, how to care for the finished bra, and where to look for further resources. I've made many belly dance bra/belt costume sets myself, and I find Dawn's advice throughout this book to be exactly on target. Though I must admit I don't always follow all of Dawn's recommendations myself, I consider her advice to be better technique than what I do. You would like to create your own costume bras rather than buying them from someone else. You are new to creating costume bras and need instructions that start from the beginning. You are experienced in making costume bras but you'd like to check your existing methods against the best practices recommended by someone else to see if there are opportunities for improving your own technique. You have no interest in creating your own costume bras. You'd like a bigger picture of belly dance costuming - for example, not only how to make a costume bra, but also the matching belt. These are the most detailed instructions I have ever seen for making the bra portion of a belly dance costume, (or a decorated bra for any other purpose). The front cover shows a full-color photo of the finished result, which is useful for reference while working through the book's instructions. The interior of the book is extensively illustrated with step-by-step photographs that show precisely what they need to show to support the text. For many of the construction photos, Dawn uses a thread color that contrasts with the color of the bra fabric, making it easy to see exactly what the stitching should look like. At various places throughout the book, Dawn suggests possible shortcuts and provides guidance in weighing the pros and cons of using them. The book is organized very logically, with all the steps in order from beginning to end. The Table of Contents offers enough detail that I don't feel the need for an index. With the bra-only focus of this book, belly dancers may find themselves trying to figure out how to make a belt that matches. If you're interested in learning how to transform a lingerie bra into a decorated costume piece, then this book is the very first one I would recommend, especially if you don't have much sewing experience. It truly breaks the process down into one step at a time and offers more detail than any other instructions I have seen for doing this. I have known Dawn for many years, and consider her to be a friend.